Propelled by the slogan “he kept us out of war,” President Woodrow Wilson won reelection in 1916. In Connecticut, however, it was Governor Marcus Holcomb’s “preparedness” platform that won him reelection that same year. 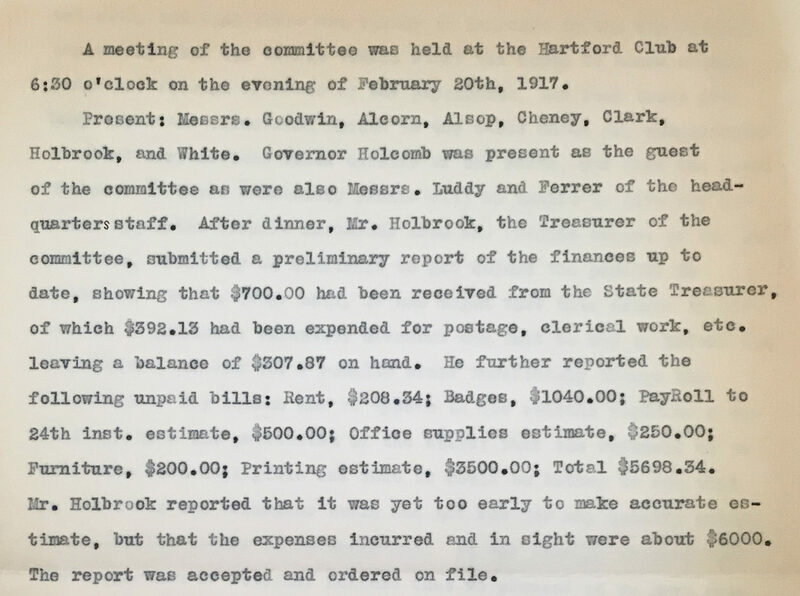 In February 1917, the Connecticut General Assembly directed Governor Holcomb to “procure certain information relative to the resources of the State,” especially about “men and materials available for use in the event of war.” The result was the nation’s most thorough pre-war military census. It included a survey of men ages 16 and up, industries in the state, doctors and nurses, motor transport (including boats), and newspapers. Much of the census was completed in March 1917, before the United States entered World War I. The original forms were deposited at the Connecticut State Library for safe keeping and to make them accessible to appropriate officials. How does the role of government change in a time of war? What did the State of Connecticut do to prepare for war prior to April 1917? What were the goals of the Connecticut military census? How did the government and/or the census committee deal with (or plan to deal with) resistance to the census? 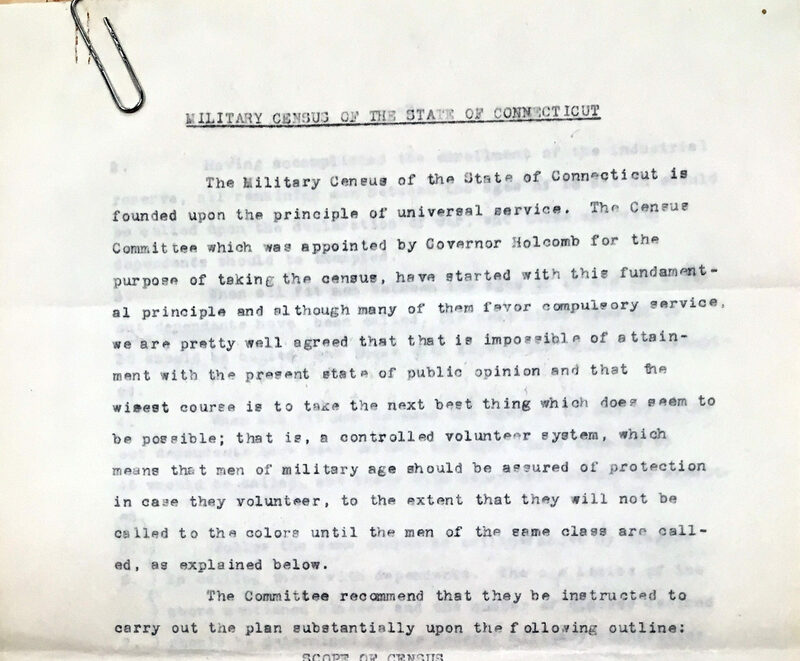 Notes regarding the Connecticut military census. Walter Clark Military Census Papers, 1917, mss 70774. Connecticut Historical Society. Sample military census form. Connecticut State Library. Note that Oscar E. Sandell listed “chauffeur” as his current occupation and responded “Yes” to the question about whether he could drive an automobile. He later served in the Army Ambulance Corps. Minutes from the meeting of the military census committee, February 20, 1917. Walter Clark Military Census Papers, 1917, mss 70774. Connecticut Historical Society. 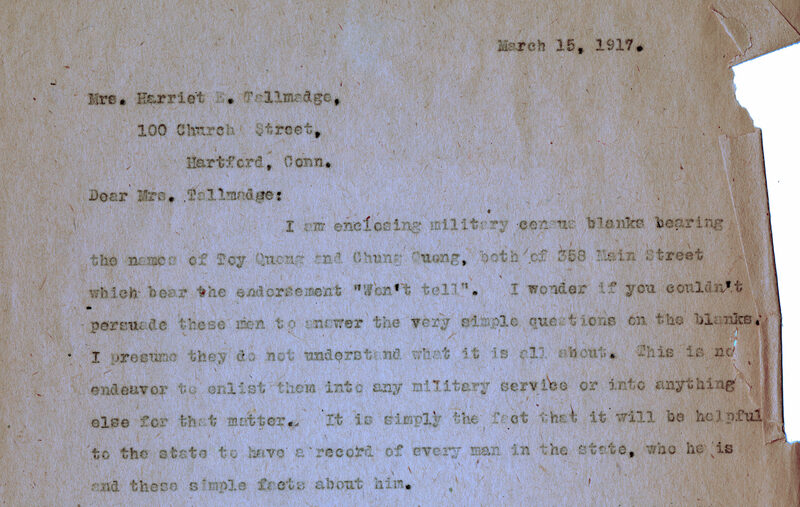 Letter to Mrs. Harriet Tallmadge regarding two men who refused to respond to the military census. 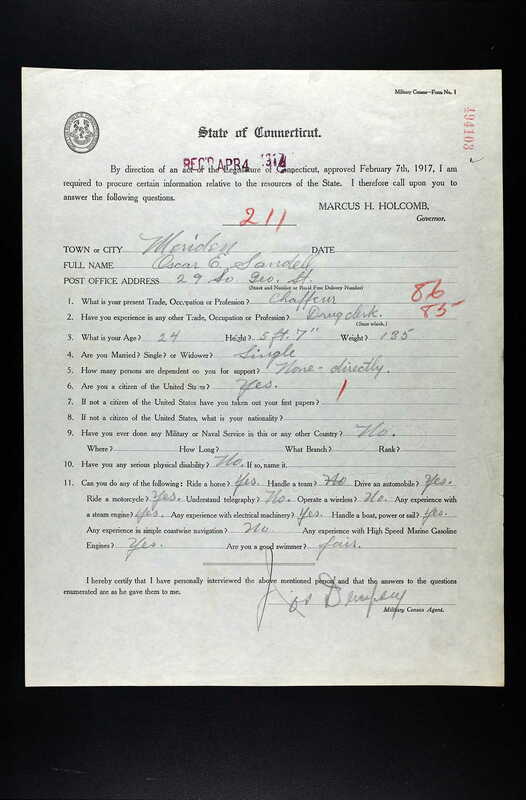 Walter Clark Military Census Papers, 1917, mss 70774. Connecticut Historical Society. Introduce the compelling question that will drive the inquiry and share/distribute the four primary sources. You may wish to have students work on their inquiry with a partner or in a small group. Using the Library of Congress primary source analysis approach, have students examine each source and OBSERVE, REFLECT, and QUESTION. You may want to use the Library of Congress Primary Source Analysis worksheet to help students organize and record their thoughts about each document. OBSERVE: What kind of document is this? What is the subject of this document? What people are identified with it? Is it dated? What can you know based on this document? REFLECT: Why do you think this document was created? Who was the intended audience? What is the historical context for the document? What can you guess or infer based on this document? QUESTION: What questions do you have based on this document? In work groups or as a class, discuss the students’ observations, reflections, and questions. You may also want to discuss some of the supporting questions listed above, if they have not yet come up in discussion. Discuss the extent to which these documents have helped students develop a response to the compelling question. Discuss possible avenues for further inquiry to help answer additional student-generated questions and develop a more complete response to the compelling question. Note: For links to some of the 1917 newspaper coverage of the military census, see the “Things to Do” section below. Using what they have learned through this activity (or elsewhere) about the 1917 military census and Connecticut during World War I, students will write a letter to Walter Clark of the Military Census Committee from the perspective of Toy Quong or Chung Quong (the men mentioned in Source #4) explaining why they chose not to complete the military census and responding to Mr. Clark’s arguments in favor of complying. Students will investigate some of the reasons why certain populations are hesitant to participate in the federal census today and why some groups are regularly underrepresented in the United States census. Students will then discuss possible responses or solutions. The Bridgeport Evening Farmer. 7:2-3. February 20, 1917. (Multiple articles) Chronicling America: Historic American Newspapers. Library of Congress. “Eastern Connecticut Loyal.” Norwich Bulletin. 9:3-4. February 24, 1917. Chronicling America: Historic American Newspapers. Library of Congress. “Over 9,000 Blanks Signed in Norwich.” Norwich Bulletin. 5:6. March 3, 1917. Chronicling America: Historic American Newspapers. Library of Congress. The Bridgeport Evening Farmer. 9:4-5. March 6, 1917. (Multiple articles) Chronicling America: Historic American Newspapers. Library of Congress. “Criticises Action of Gov. Holcomb in Taking State Census.” The Bridgeport Evening Farmer. 2:3. March 15, 1917. Chronicling America: Historic American Newspapers. Library of Congress. Connecticut State Library resources available on Ancestry.com. Includes the Connecticut Military Census forms. Free access with Connecticut public library card number. ConnecticutHistory.org: “Winning the Great War without Some Books” by Mark Jones. CTExplored.org: “When Books Became Enemy Propaganda,” by Mark Jones, Connecticut Explored, Fall 2014.